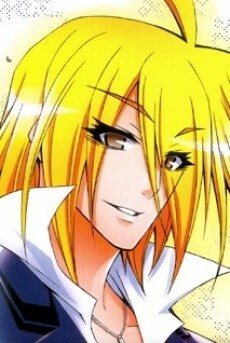 Academic Status: 2nd year, Class 11 Age: 16 Blood Type: AB Affilation: Currently Judo Club (previous Medaka's Student Council) The Student Council Secretary and the oldest member of the Student Council, as he is a second year while Medaka, Zenkichi, and Kikaijima are in the first year. Originally part of the Judo Club, Akune has been infatuated with Medaka since middle school and hates Zenkichi for being able to spend so much time with her. In middle school, he had been a violent delinquent known as the "Destroyer" and had been assigned by Kumagawa, the president of the middle school Student Council, to beat Medaka. While she was injured, she did not fight back; Akune continued until Zenkichi gathered a group of Medaka's supporters to avenge her. When Medaka stopped Zenkichi from hurting Akune, Akune immediately developed feelings for her, which she refuses, and gradually becomes less violent and shows little desire to actually hurt others. Because of his natural fighting abilities, Akune is known as the "Prince of Judo" and the star of the judo club. Because the captain of the club, Nabeshima, despises natural genius, she arranges a match between Zenkichi (whom she favours) and Akune in order to recruit Zenkichi to succeed her as captain of the judo club if he loses to Akune, who will join the student council. Akune loses the match, but is still recruited into the Student Council after Nabeshima tells Medaka that Akune has beautiful handwriting. Both he and Kikaijima are considered to be 'specials', above average, but not quite abnormal. It has been said that Akune's ability is being able to copy other peoples abilities, but to a lesser extent. Ten years later, Akune reunites with his friends on the tenth anniversary of Ajimu's disappearance. He chastises Zenkichi and Kamome Tsurubami after they arrive, reprimanding them for their behavior. Akune is now the owner of a successful toy company, who enjoys creating new toys with own hands. He discusses Nabeshima's success as an Olympic athlete with Tsurubami and Kikaijima, while he and Zenkichi discuss Kiruko Tachiarai.Wanizuka latches on to Akune's arm, revealing that the two of them are now married. Akune expresses his pleasure with their fellow students' numerous successes.